The CoffeeShop Blog: CoffeeShop Orton Action for PS/PSE! CoffeeShop Orton Action for PS/PSE! I have rewritten and improved the original CoffeeShop Orton Effect with Contrast Kick so that now it runs on Photoshop AND Photoshop Elements, is completely adjustable, and has a layer mask so you can mask out areas of the effect and also a color mute layer which can be turned on to mute the vivid colors of the Orton (very effective in portraits). If you don't know what the Orton Effect is, please visit this link. 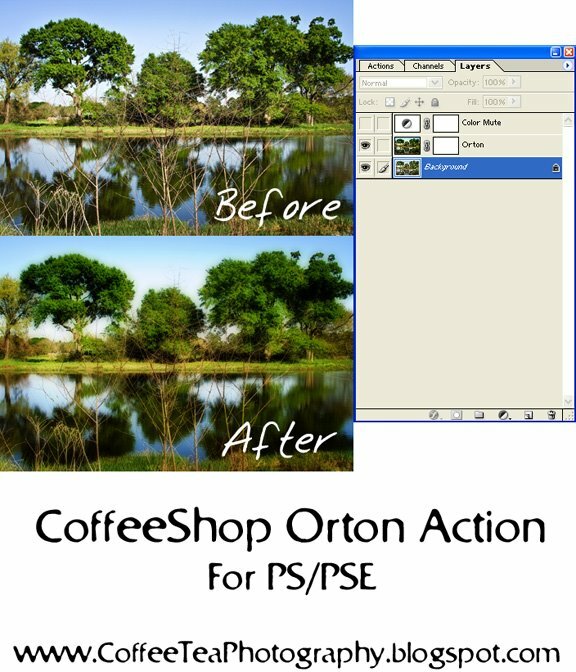 Download the CoffeeShop Orton PS/PSE Action HERE! Great effect. Thanks so much! I tried downloading it but it didn't work. I want to thank you for sharing these actions with us. Love them all. Thank you so much! can't wait to try! Is it just me? I got an "invalid file" error message when I tried to download. ??? Cool! Thanks for sharing your talents with us. Thank you so much for sharing all your fabulous actions! I so enjoy them ALOT ALOT!! Thank you so much for this Freebie. I want to let you know that I posted a link to your blog in Creative Busy Hands Scrapbook Freebies Search List, under the Photoshop/Gimp Resource(s) (Brush(es), Swatch/Palette, ...) post on Feb. 19, 2009. Thanks again. I think this silly thing is picking on me! I've tried a dozen times and it won't cooperate. Boo. Did you get the re-send of the ballet photos?? Oh wouldn't you know it...the minute I post to tattle, it finally worked. Thank you SO MUCH for this and all the other actions! I love them and having little ole PSE it isn't so easy to find actions that work on it. I am having the best time playing with all your cool actions. I also tried but it would not work. I will try again in the morning. Thank you so much for sharing! I love all your actions. I hate that the download is such a problem! If you can't get it after a few tries, please email me at coffeephotolove@yahoo.com and I will email it to you. Thanks so much for the great action! I appreciate you sharing your talent!!! Thank you very much for sharing your awesome actions with us! All my photography is so improved since I found you (and that will be our little secret ... right ? !!) Thank you so much for offering these brilliant actions for free !! I know that "I" really appreciate you and your work !! Where do you download this to in Photoshop Elements? Thank you! I love all your actions and love how easy they are to use. These are all fantastic, but I love this one especially. My photos look dreamy! Thank you! Thank you for the fabulous Action download. I am very impressed with this one!